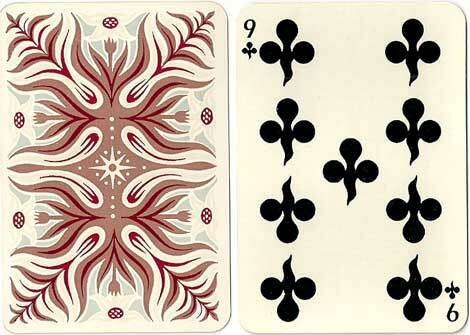 Promotional playing cards created for the famous Parisian store by A. M. Cassandre (pseudonym of Adolphe Jean-Marie Mouron, 1901-1968) with abstract, almost surrealist figures and ornamentation inspired by medieval art and rendered into an Art Deco idiom. His sensibility was also influenced by cubism, yet his aesthetic was superbly original. Cassandre was a Ukrainian-French painter, commercial poster artist, and typeface designer. He created an enormous corpus of graphically groundbreaking work, including travel posters, typefaces, and advertising. In 1963 he designed the well-known Yves Saint-Laurent logo. 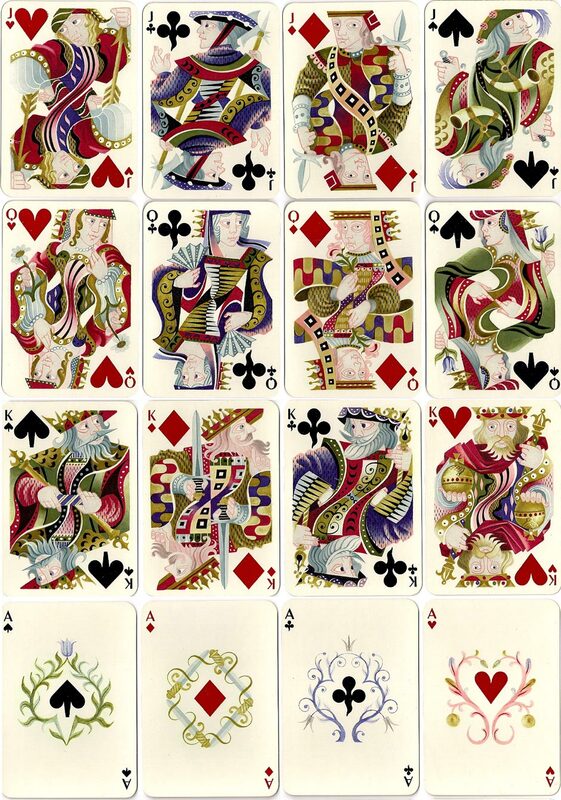 These cards are from the original 1948 edition of playing cards designed by Cassandre for Hermès-Paris and made by Draeger Frères, also of Paris. 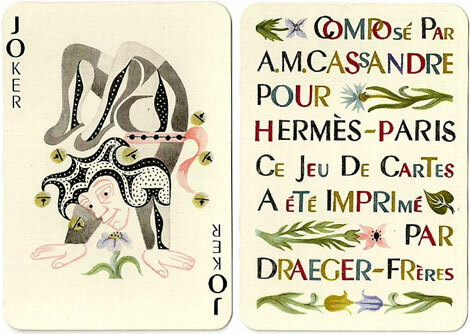 Above: cards from the original 1948 edition of the deck designed by Cassandre for Hermès, Paris and made by Draeger Frères, also of Paris. The cards were sold as a double deck set with each deck in its own tuck case and both tuck cases housed in a larger plain brown box with Hermes name and address on it. The tuck boxes are printed, front and back, with the back design of the cards. Images from the collection of Rod Starling.